Have guests in town during the holidays? 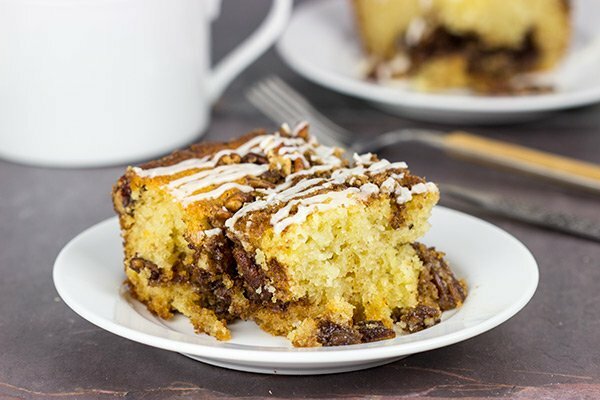 Make breakfast easy with this Overnight Coffee Cake! I have a weakness for coffee cake. I say weakness, but what I really mean to say is that coffee cake is my Kryptonite. I can’t walk past it without at least grabbing a slice…or two. My sister even mailed me my favorite coffee cake for my birthday this past year. See, I told you I loved coffee cake! There’s something about the combination of brown sugar, cinnamon and nutmeg that stops me dead in my tracks. This Overnight Coffee Cake has been a family favorite since…well, since I can remember. Aside from being incredibly easy to make, this Overnight Coffee Cake is packed with flavor, too. It’s topped with a cinnamon + brown sugar + pecan crust that is guaranteed to get you out of bed…quickly! 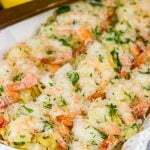 This is the perfect recipe to have on hand when out-of-town guests come to visit. Make the cake up the day before and just store it in the refrigerator overnight. Then just stumble into the kitchen and pop it in the oven before your guests wake up. As this coffee cake bakes, the smell of brown sugar and cinnamon will fill your house, and I can assure you that your guests will be awake shortly thereafter! My mother has been making this Overnight Coffee Cake for years. Even to this day, whenever I go to Nashville to visit, I can count on this coffee cake making an appearance. Heck, it’s easy and delicious…what’s not to love about that? In fact, this cake was one of the first recipes I learned how to make from scratch after I graduated from college. Back in my bachelor days, I didn’t know much about baking. I thought breads and cakes just magically appeared. I thought the Keebler Elves were real. But then my mom taught me how to make this cake. I was hooked. Baking become a passion, but this Overnight Coffee Cake is still one of my favorites! Keep this recipe handy for when guests come in town during the upcoming holidays…but don’t count on having any leftovers! In a medium bowl, combine the butter, sugar and sour cream; whisk together until well combined. Add the eggs; mix until well combined. Add the flour, baking powder, baking soda, nutmeg and salt; mix until well combined. Pour batter into a greased 9"x13" baking pan. In a small bowl, make the Topping by combining the brown sugar, pecans and cinnamon. Sprinkle Topping evenly over the batter. 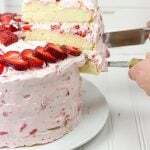 Uncover and bake at 350°F for 40-45 minutes, or until a toothpick inserted into the center of the cake comes out clean. Whisk the Glaze ingredients (powdered sugar, milk, vanilla) together until smooth. Allow cake to cool slightly and then drizzle Glaze evenly over cake. Hahaha – I wish those Keebler Elves were real!!! I adore coffee cake – but overnight coffeecake has regular coffeecake trumped! Thanks for sharing your mum’s recipe – I might sub that flour for some GF lour so my daughter could enjoy this too – but then again, maybe I should just make it with regular floor so I can keep it all to my self!!! Hehe! 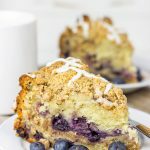 Breads of any variety are my kryptonite and I’m drooling over this coffee cake! I would love a slice of this with my morning coffee. Looks delicious! I couldn’t agree with you more, Cindy! 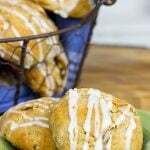 Baking breads is pretty much my favorite thing ever…and then if cinnamon & nutmeg are involved, too? Well, that’s where the kryptonite part comes in! You are totally right. Coffee cake is kryptonite! And I would love to wake up to this delicious treat in the morning. Love it, David! This coffee cake is so easy to make, Sean! Of course, you can lie and tell your family/guests that you worked on it for hours…I won’t tell! I think we were separated at birth! Seriously, I love, love, love coffee cake. I think it’s the cinnamon. 🙂 And the cake too. LOL! Adding this to the list of things I need to make from you website. Haha! Thanks, Tamara…maybe we are actually long lost twins. You hear about that happening now and then. 🙂 But yes, coffee cake is probably my #1 weakness. I think Thanksgiving week is a great time to do some baking, right? I totally agree, Becca! I always bake this coffee cake in the morning, but then the leftovers become lunch dessert, afternoon snack, dinner dessert and of course late night snack. But then again…there are rarely leftovers! 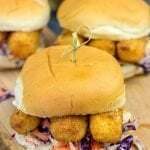 This looks perfect with my Quad espresso right now and I love the overnight idea. Never thought of that, keeps the calm of the morning going by just popping it in the oven. Yup, you don’t even have to be awake to pop this bad boy into the oven! But give it about 15 minutes, and your entire house will be filled with cinnamon and nutmeg…and then you’ll be out of bed in no time. And now I want an espresso! This is one of our favorite as well, but yours in taken up a notch, love it! I LOVE coffee cake after…I ate it at Starbucks. Geeze, that coffee shop should hire me to be their marketing for everything NON coffee related! The fact that your sister mailed you some- Respect. I don’t have guests coming anytime soon but damn I’m making this..for me. Hahaha…it sounds like you lived in Starbucks while you were here! I hope you at least had some coffee with your cake. 🙂 And yes, I have definitely been known to make this overnight coffee cake for just myself. I’m not ashamed. 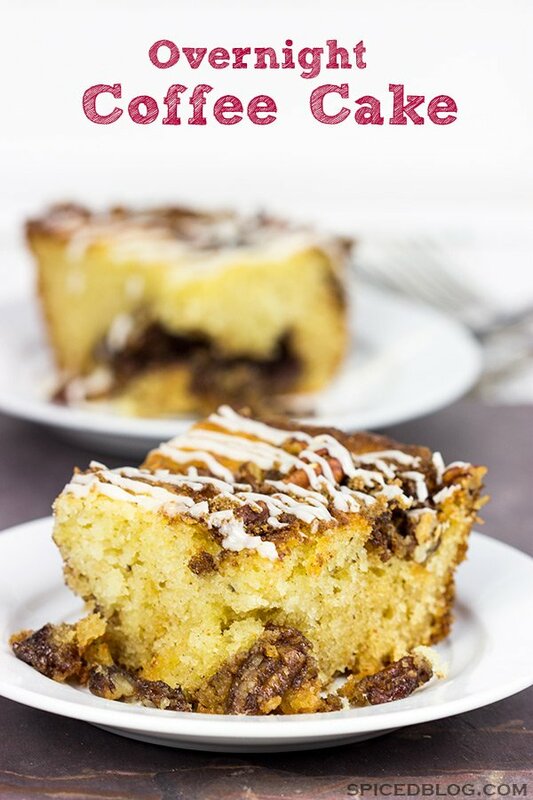 I love coffee cake and this overnight cake looks beyond delicious. Craving a slice right now! Thanks, Thalia! 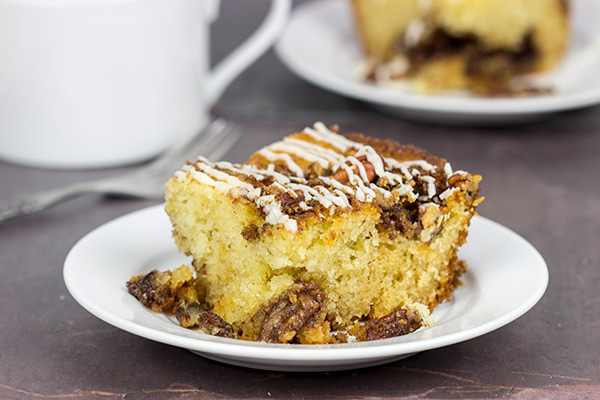 You and I both share a love for coffee cake…and this one is one of my favorites. 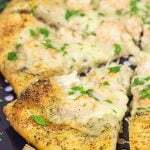 It’s delicious and super easy…how can you go wrong with that?? Would you judge me if I just made the cake for myself? No guest but just me and this cake. Oh and coffee is invited too. It looks so moist and soft. Perfection, David! Pinned! I would definitely NOT judge you if you had a party and only invited yourself and this cake. Would you judge me if I told you that I may or may not have done that exact thing in the past? This looks so amazing! I want to try this out now! But, what happens if I leave out the nuts? Is the result still worth it? Personally, I looove pecans and nuts of all sorts (except the people kind), but finicky kids, ya know? I totally understand, Yael! I think the nuts add a ton to this coffee cake, but you could totally do it without the nuts if there are picky eaters around. It would still be loaded with cinnamon goodness! I hope you enjoy it as much as I do! You are a hero!! I tried it without the nuts and it was fabulous!!! I wasn’t sure how this would turn out without the floury, buttery crumbs I am used to on coffee cake. But it was really super (and half the fat of a a New York-style coffe/crumb cake). Definitely a keeper. Thank you! This sounds so delicious. I am definitely going to make it. A question: Do you have to let the batter come to room temperature before putting it in the oven or can you just take it out of the fridge and bake it? I’m in love and looking just for an over night fridge style coffee cake. I will substitute allspide for cinnamon…of all things to be sensitive too. I KNOW…took me 30 years to discover it was Cinnamon. But it’s amazing how often you sub allspice and sometimes blends with ginger and nutmeg and no one at all realizes it didn’t include cinnamon. This one is going in the oven tomorrow mornining. (Sans the cinnamon of course.) LIfe is so GOOD if it includes coffee cake. Hey Leslie Anne! Thank you so much for stopping back and leaving a comment. It really means a lot! I absolutely agree with you that life is better with coffee cake. This overnight version has been passed through my family for years, and it makes regular appearances whenever we get together…and it’s a Christmas morning staple for sure! 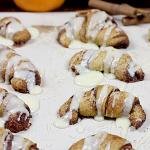 I don’t think I’ve ever heard of a cinnamon allergy, but good thing you figured it out. And you’re right…if you use the other warming spices like nutmeg and ginger (maybe mace, too? ), then folks rarely notice. I hope you enjoy this coffee cake recipe as much as we do! Happy baking!